Last Friday evening, fiber and mixed media artist Melissa Maddonni Haims invited me to the opening of her new installation and performance piece at Old City Philadelphia’s 3rd Street Gallery. I was so honored to meet Ms. Haims in-person and freely discuss her creative process, which was first introduced on artdoesmatter last April, during Philadelphia’s city-wide FiberPhiladelphia biennial. Melissa Maddonni Haims: “Offering”. 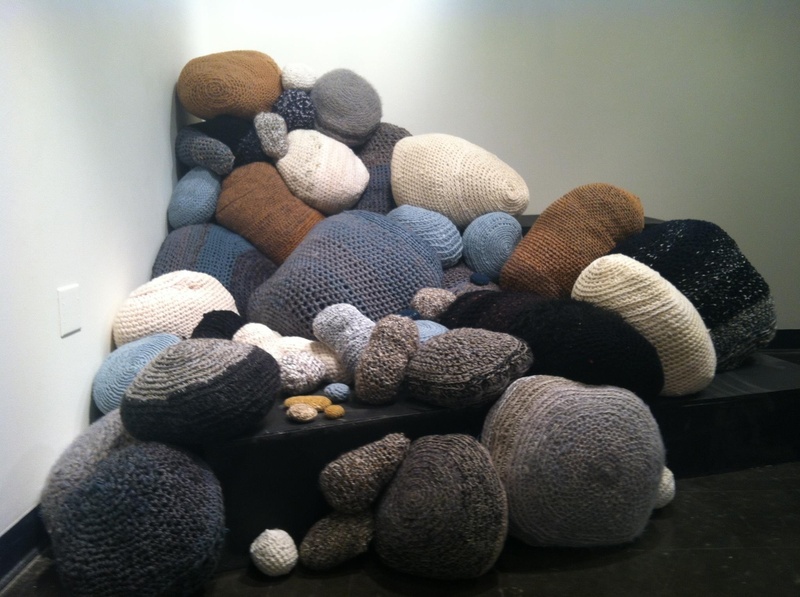 Crocheted sculpture, dimensions various, 2013. Offering is a site specific performance and installation piece that was conceived by Haims last summer of 2012, after the tragic passing of her childhood friend of twenty-six years, who was killed instantly by a drunk driver at only age thirty-nine. Haims was extremely forthcoming and moving as she recounted her experiences during this past year as she retraced the steps of her friend’s life, revisiting and photographing the places where her friend lived and worked. Haims has woven a montage of “stones” from crocheted yarn, meticulously created in memory of her friend; each piece is representational of how various cultures use stones as a marking tool to remember deceased loved ones, or as an actual marker of territory to find one’s way home from a journey. Melissa Maddonni Haims: “Offering”. Photo installation manipulated and printed on canvas, dimensions variable, 2013. To the direct right of the crocheted stones hangs a photo installation of twenty symmetrical images taken by Haims throughout the Philadelphia metro area as she retraced her friend’s steps and life adventures. As the artist explained to me that night, we see the home where the deceased grew up, the neighborhoods where she would run by day/night, the school where Haims and she met and tragically, the street sign that marks the road where her friend was tragically killed. The filters that naturally occur as part of the Instagram photography app seem to oddly compliment and add to the haunting quality of each individual photo, as the artist has further manipulated some images beyond the built-in filters to communicate her understandably distraught feelings with her viewers. “Offering” installation. 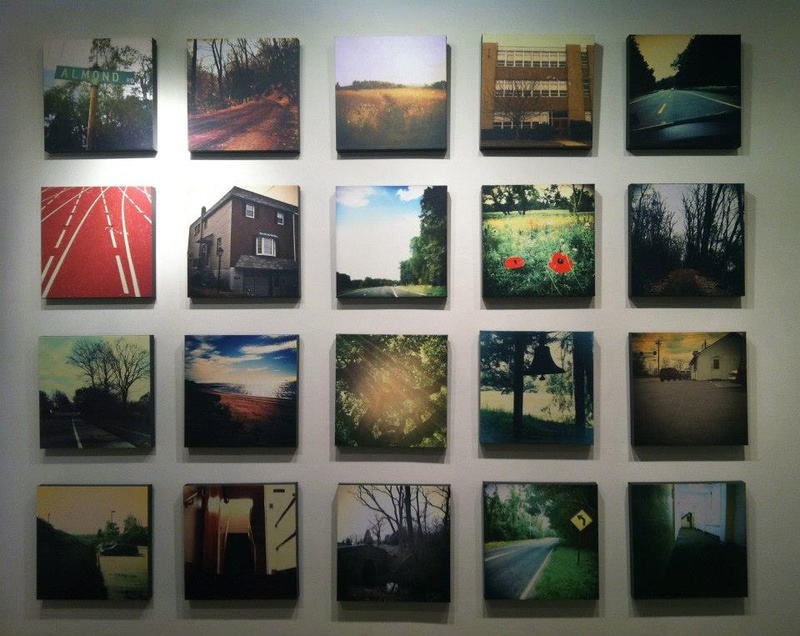 Artist-manipulated Instagram photography mounted on canvas, silk-screened text, 2013. One of the topics that arose during my conversation with the artist revolved around this section of the gallery installation. Haims very openly and candidly admitted to feeling she should have possibly considered seeking out grief counseling to cope with her friend’s loss, but instead found herself in the midst of using the study of creative writing to sublimate her feelings of loss and sadness. I pointed out in our discussion that evening that her previous work used embroidered text – noticeably embroidered across her cascading fiber sculptures in various-colored thread; however, in this exhibition, Haims chose to silk-screen poetically – and even more noticeably – across the side wall of the gallery in stark black-and-white sans-serif typeface. Was this due to Haims subconsciously deciding that these poetic words were NOT to be glossed-over, as I discussed in my earlier post of her work that used a more passive form of Victorian-styled aggression in her embroidered texts. Haims may have chosen to more starkly silk-screen her poetic remembrances across the white gallery wall instead to openly show her own offering to celebrate and honor the memory of her beloved and close friend. Melissa Maddonni Haims is one of two artists exhibiting this month along with fiber artist Carol Wisker at 3rd Street Gallery through June 2nd, located at 58 N. 2nd Street in downtown Philadelphia, PA. Dawn, I’m so glad you stopped by. One thing I wanted to add is that Melissa will be in the gallery three afternoons per week, actively crocheting new “stones” to add to the installation. So the photo above is only a snapshot of the entire work. You’re so correct in that it is a very moving exhibit to see in-person. Thanks again for your fabulous comments! The crocheted stones are incredible. I would also love to see them in person. What an incredible way to express oneself so poignantly! I agree! The colors of the slate-blue and the sienna-brown yarns are so much more vibrant in-person. Thanks so much Cathi for stopping in and leaving such lovely comments! Oh my god, Rita – I am so deeply sorry. I can’t even begin to imagine how and what your husband’s life must have been like at so young an age to face such tragedy (and also his brother/family members). I really appreciate you sharing this w/me, and I’m sure Melissa Haims would also appreciate an extremely talented fiber artist like you making a connection to her work and this particular piece. I’m so happy you stopped by – thanks so much, Rita. Really creative! Hat off for that! The story behind this installation is deeply, deeply moving. Thanks for sharing this. Thanks so much, Lu. I really appreciate your visits to my blog! Melissa’s installation is pretty incredible, and I’m fortunate to be able to see her work in-person. I’ve been enjoying your blog too – I love the way you’ve been relaying all of your experiences while traveling in France. Always look forward to what you’ll post next! Patricia, I can tell by this post how deeply moved you were by Haims’s installation. What a lovely homage to a soul who left this world too early. This is a perfect example of how art and writing can channel what would otherwise be difficult emotions into something quite sublime. 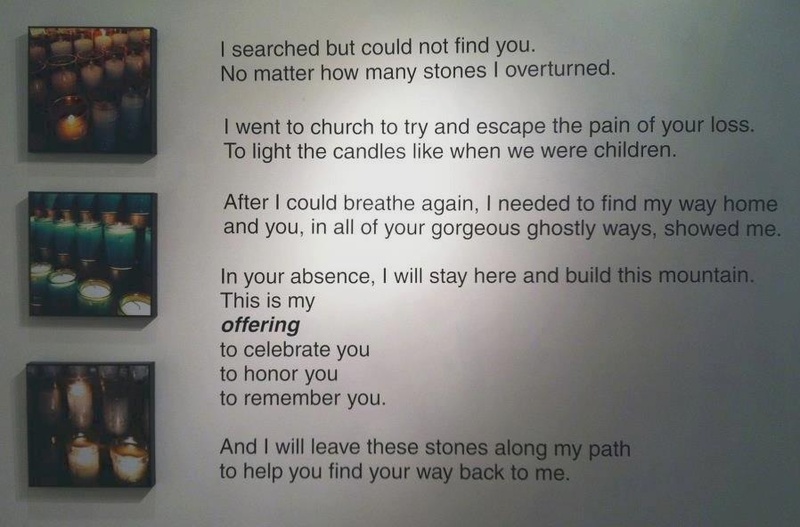 Gina Marie, it truly is a very moving piece. And what you’ve said further expresses all the emotions that we viewers experienced last Friday night at the opening. Thank you again so much for dropping by and sharing such wonderful insights. Wow! and Wow again. I connect with this artist. I have always expressed my feelings through yarn. The stones concept is amazing. As you mentioned, humans have used stones as markers for ever. Humans have used art as expression and communication for ever too. I feel privileged to have seen this exhibition and thank you for showing it to us. one more Wow! Sharon, I’m really pleased that you stopped in and shared your reactions to reading about Melissa’s installation. As you are a gifted and prolific fiber artist yourself – hearing your thoughts about this piece really makes me happy. This is why I blog – not only for pride about the varied local artists we have, but to share all of this incredible work that I’ve been so fortunate to see and react to, in-person. Thanks so much for your great feedback and comments! Great post Patricia! The crocheted stones are poignant, and sad, but also quite comforting – and the photos a perfect complement to them. A difficult subject matter, but a very strong, personal, multi-layered piece that anyone can relate to. What a beautiful offering and tribute to her friend! Thank you for sharing this wonderful work with us. Dominique – you basically have read my mind. I did in fact find this a difficult subject to write about, and the stones do invoke feelings of sadness. But yes, you’re so very right in saying they are also there to provide the viewer with a sense of comfort. Thanks again for your lovely comments. I always look forward to your visits to my blog!! What a superb review Patricia! The stones themselves are intriguing with their subtle colours. I wanted to bury myself in them. But reading on and finding the wall text led me way beyond the sensory. The poetry gave so much to the stones, I wanted them to be side by side. Such profound sadness so beautifully expressed. And interpreted so sensitively. Philippa, you’re so right in that there are two levels to this work: the sensory and the overall poetic meaning. What a wonderful reaction to this installation – seeing both sides of the piece. I’m so thrilled you stopped in to visit – you always leave me with many more intriguing things about the work discussed than I’ve even thought of on my own! Thanks again, Philippa! Always an interesting visit Patricia! Art does matter. I am mad about this site. “art does matter”. To me it is the quintessential example of how wonderful the internet can be. Here in Australia I get to see examples of fine art put together by Patricia Sullivan (a talented and gifted artist herself) that I would otherwise never have the opportunity to see. Of course it isn’t as good as seeing it for real but it is still wonderful. No stranger to grief myself, I was deeply moved by this exhibition of Melissa Maddonni Haims and I know you will be moved too. Sharon, I am so flattered by your lovely and generous compliments and really appreciate your re-blog! Thanks so much! A beautiful memorial! Reminded me of my cousin who was killed by a drunken, unlicensed 19 year old who was evading arrest. I wasn’t close to her, but am close to her mother. The driver got less than 2 years! But this art piece is stunning and worth checking out. Thank you so much, Linne!! Your post is wonderful and the crocheted stones are incredible! Thanks for sharing. Thank you, Elisabeth! I am really enjoying reading your blog – the Jean Paul Gaultier crocheted dresses you posted about are just out of this world. Thanks so much – I know I’m going to love following your blog! I will need some time to read your previous blogposts and of course I’m looking forward to the future ones.